A long time Westportian, Max Bibicoff ’16 is very excited to finally write for and become a part of inklings. Bibicoff enjoyed spending seven weeks of this past summer at camp Echo Lake. He has attended camp there since 2007, and is sad to say that this summer was his last. Although Bibicoff will be too old to be a camper next summer, he still plans on spending his summer vacation with his camp friends. When asked why he enjoys journalism, Bibicoff responded by saying, “writing is one of my favorite things to do in school in general”. He finds journalism to be fun because it is a unique type of writing that isn’t found in other subjects. Bibicoff especially enjoys that two of his favorite subjects, English and Social Studies/Politics get drawn together in this type of writing. Bibicoff spends much of his time outside of school playing tennis, and is always excited for REC basketball season in the winter. Bibicoff’s start to the world of journalism was when he took intro to journalism the first semester of his sophomore year. He took intro with the intention of writing for inklings. Bibicoff envisions himself pursuing some sort of career in the future that involves social studies or English, and quite possibly journalism. Overall, Bibicoff finds the journalist to be an important role in society, and that they have a lot expected of them but also a lot of freedom. 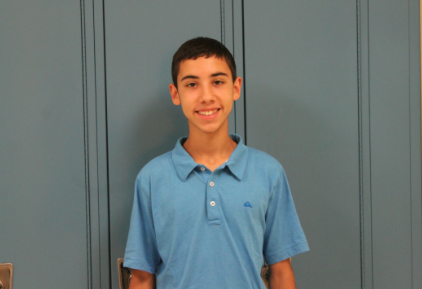 Bibicoff is excited to be apart of inklings and make his debut as a staff writer 2014-2015.